EDINBURGH’S top police officer has hailed the start of the Capital’s festival season as “fantastic” despite a spate of muggings. Chief Superintendent Mark Williams said an annual policing operation was having a positive impact during the busiest month of the year. Plain-clothed officers seized a large quantity of drugs in the Southside area while reports of bag and phone thefts are down on last year. Ch Supt Williams, the city’s divisional police commander, also vowed to bring a gang of teenage muggers to justice after three victims were targeted in the space of just an hour at the weekend. Speaking to the Evening News during a live video Q&A, he said August was always a challenge, given that the Capital’s population doubles to more than a million people. “It’s been a fantastic operation so far, it’s busy. We see crime going up during August – that’s a typical pattern in Edinburgh,” he said. He revealed that between August 1 and 9 last year, there were 72 reports of handbag and mobile phone thefts; while in the same period this year, there were 43. However, while there were 17 reports of shoplifting at the start of August last year, there were 30 at the beginning of the 2015 Festival. He said he was “confident” that there would be arrests following the three muggings in the city centre between 4.30am and 5.30am on Sunday. The two teenage suspects are believed to have been operating as part of a wider gang, and targeting people who were out enjoying the later opening times of the city centre bars. 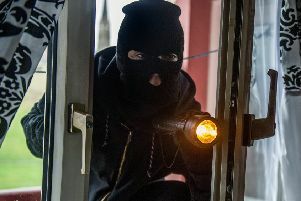 The thieves made off with money, wallets and phones during their one-hour crime spree in Blackfriars Street, Market Street and Montrose Terrace, and the victims all hailed from Edinburgh. Ch Supt Williams revealed that plain-clothed officers working as part of the Festival patrol had seized an extensive haul of Class A and B drugs in the Southside area. During a stop-and-search in Nicolson Square last week, a man was found to be in possession of a lock knife, heroin, cocaine, diazepam, cannabis, five mobile phones and several hundred pounds in cash. A further stash of drugs was found when officers raided his home later that day. In another case, officers chased a man down Nicolson Street after suspecting him of suspicious behaviour. When he was searched, he was caught with 20 wraps of heroin and a substantial amount of cocaine. Beefed-up police patrols will continue throughout the festivities, while an ongoing social media campaign is running to remind people to look after their belongings.